A chicken tractor is truly a wonderful thing. On the homestead or in the backyard, these floorless, movable chicken coops allow you to fully utilize the benefits that chickens offer. 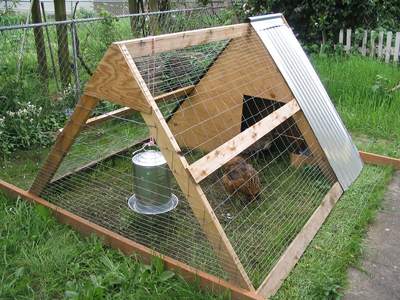 Most movable chicken pens are built with a wooden skeleton and chicken wire walls. They usually have a small sheltered area built into one end that contains a roost (a horizontal stick that the chickens sleep on) and a nesting box (for laying eggs). Dimensions vary depending on the number of chickens, but the tractors are usually 4 to 10 feet wide and 6 to 15 feet long. Most tractors also contain a water source and a feeder. What size should your chicken tractor be? The amount of birds in a flock will dictate the square footage of the tractor. It is a ratio of 1-2 birds per 3 square feet of space. So if you live in the city with a 6 bird flock you would probably build a 4 ft. x 5ft. tractor. If you are raising a big flock of 40 meat chickens on pasture, then you are looking at a 5ft. x 12 ft. pen. I know of one farmer who keeps 70 birds in a 10 ft. x 12 ft. tractor. 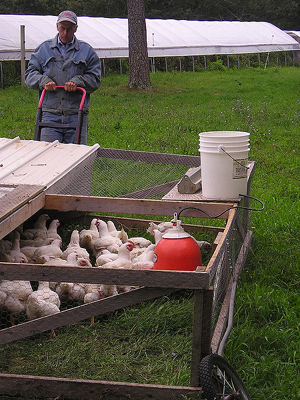 Movable chicken pens allow chickens to find bugs and plants to eat. This is the diet that chickens would have if left to their own devices. Other game birds like wild pheasants eat more bugs and plants than they do grains. Chickens belong to the same scientific family as many of these game birds. Have you ever watched chickens that are fed an all grain diet? They eat the feathers off each other’s backs due to the lack of calcium! Insect exoskeletons provide this essential nutrient to chickens in well managed tractor systems. The chickens aren’t the only ones who benefit from a tractor system. The holistic gardener can use chickens in a tractor to fertilize their garden beds after the fall harvest. The birds will eat any remaining pests and do some autumn weeding. They will be happy to mow your lawn. Let’s compare the chicken tractor to other flock management systems. The chicken pen or run is a closed off area much like the tractor. The difference is it doesn’t move. If chickens are on the same ground for an extended period of time, that ground will become void of life. It will become bare dirt. A mud pit. The flock manager must buy more food and import it into the chicken living quarters constantly. The one benefit a fixed pen has over a tractor is more protection from predators (especially those that dig). Free range chickens (birds that are able to forage where they wish) are probably the healthiest of all. They can access food at the base of trees and shrubs where a tractor could not be placed. However, there are two downsides to free ranging birds that a chicken tractor would relieve. One downside is the susceptibility to predation from above (hawks), alongside (weasels and raccoons), and below (gigantic rats). The other downside is the chickens scratching ground that you don’t want them to scratch and eating plants you don’t want them to eat. The moveable chicken pen benefits the gardener, the chicken, and the ecology of a homestead. 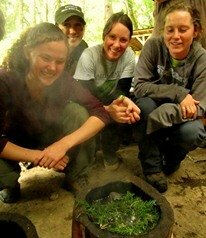 It provides the protection of a pen and the fresh ground of free range. It takes a few minutes every day to move the tractor, but the benefits heavily outweigh the drawbacks.